You need to upgrade your Flash Player. Click here to upgrade. You expressly understand and agree that: (a) this site and any of the services are provided on an “as is” and “as available” basis and that this site makes no warranties, representations or conditions (as used in this section “warranties”) of any kind, whether express or implied, including but not limited to implied warranties of merchantability, fitness for a particular purpose and non-infringement and that any such warranties are hereby expressly disclaimed, and (b) this site specifically makes no warranties that a it or any of its services, including any content, information, products or services obtained from or through the use of this site or any of the services, will be provided on an uninterrupted, timely, secure or error-free basis or that such services or the results derived therefrom will meet your requirements or expectations. The email address you provide for order processing, will only be used to send you information and updates pertaining to your order. If you decide to opt-in to our mailing list, you will receive emails that may include company news, updates, related product or service information, etc. Note: If at any time you would like to unsubscribe from receiving future emails, we include detailed unsubscribe instructions at the bottom of each email. All merchandise purchases fall under Canadian Law. Any merchandise purchases made outside of Canada are still protected under Canada’s jurisdiction. There are no refunds on our event tickets, competition registrations, workshop registrations, or hotel nights. Your registration and payment guarantees your seat at the event or space in competitions, workshops, or hotel rooms. A service and/or delivery fee is added to each ticket and/or order purchased online at time of checkout. The buyer agrees to pay these fees, and understands that they will not be refunded under any circumstances. Website hosted by Dreamhost: PMB #257, 417 Associated Rd., Brea, CA 92821, USA. Watch this area for exciting 2018 news! 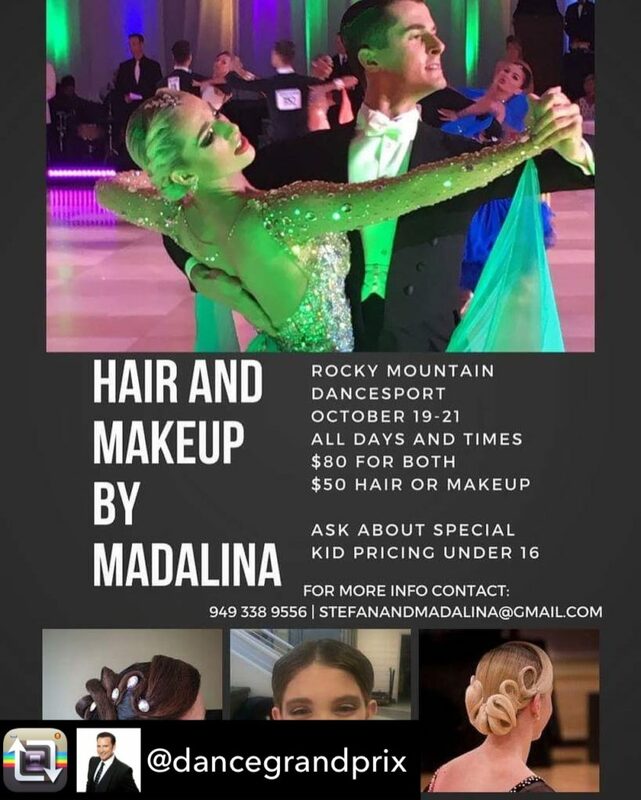 © 2019 Rocky Mountain DanceSport Grand Prix. All Rights Reserved. Photos of Jean-Marc Généreux courtesy CTV. Ballroom photo (in slideshow) courtesy Xtreme Photography. Dancesport Competition photo courtesy Patrino Photography.